Nevertheless, I was so happy to finally meet him, because I've never dreamt that he'll ever come to Bulgaria. I want to thank the publishers, who invited him to our book fair! It was such a pleasure for all of his Bulgarian fans! And can I just say, that Patrick Ness seems like such a lovely person! He was smiling all of the time and was making jokes. Meeting him was priceless! If there are people who don't know who Patrick Ness is - he wrote some of the most unique books that I've read, such as the "Chaos Walking" series, "A Monster Calls" (are you excited about the movie, because I for sure am), "More Than This" and his most recent book "The Rest of Us Just Live Here" (which is going to be my first read for 2016, because the new year must start with a bang). 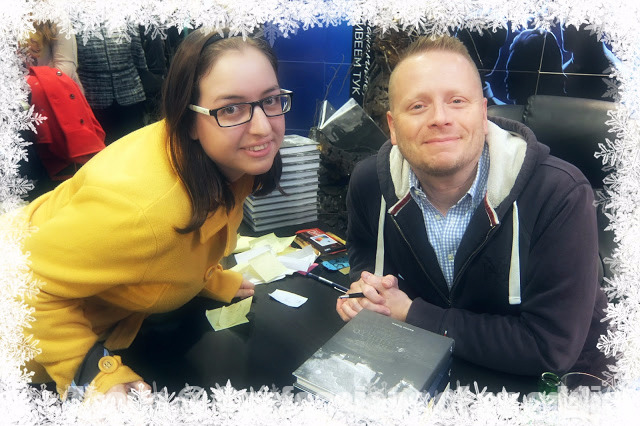 That is so great that you got to meet Patrick Ness! I was a complete potato when I met Marissa Meyer about a month ago as well! I've been wanting to read the Chaos Walking trilogy for some time, and 2016 looks the year to do so!